After a couple months of waiting the Fiends from Dream Valley team have finally released a tech demo for their flash game. It mainly showcases the engine and doesn't have much gameplay other then jumping around, moving physics-based objects and talking to the occasional pony, but it certainly looks promising. The demo also seems to be in a rather unstable state, with plenty of bugs and terrible performance slowdowns plaguing the game, especially when running in fullscreen mode via the downloadable .swf file. So if you want to try out the demo, go ahead. I'm not gonna stop you, but at the moment there's not really much to see, unfortunately. 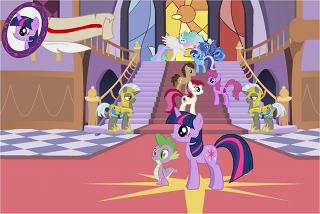 Also, the screenshot above was taken from DerpyHooves News, as it is impossible to take screenshots in-game with my Mac without bringing up the character selection UI. Sorry!